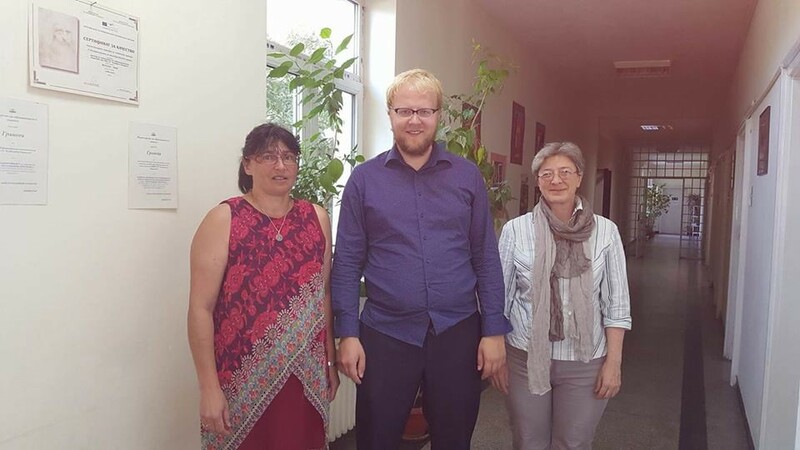 I am Florian Zejewski from Germany and visiting Euraxess Bulgaria as a part of an intership program of the HdBA - University of Applied Labor Studies. I graduated with a Master of Arts in Political Communication at the University of Bielefeld, Germany and was trained in general rhetoric, counselling and guidance as well as sociology and political science, specializing in labor market economics, Chinese political strategy and recent developments in the Asia-Pacific. Having a variety of intercultural interest, I also like to learn more about Europe and foster new relations around the world. Why did you want to intern/train with us? I would like to start deepening European solidarity with getting to know the neighboring countries, getting inspired and getting an understanding of current issues from another perspective. Learning about Bulgaria and the Balkan countries is very interesting and a recent of focus of the European Union, so I also like to get a better understanding, meet new people and explore the culture, customs and traditions. So my internship at EURAXESS can combine my interest in the Balkans and my professional work in a very good way. As I am partly working in the german employment agency the field of career development at EURAXESS is a very clear link to my professional work experience. The basic idea of EURAXESS and employment agencies are finding jobs for people, so working at the EURAXESS network and learning about the EURAXESS procedures and activities can help me to enhance my skills in professional environments. So I am very thankful to the HdBA and EURAXESS, who made this internship possible. Especially the perspective of helping researchers, forming a very strong and international network to bridge science, industry, entrepreneurship and job opportunities in various projects, is a very new perspective to me and very helpful in my understanding of potentials of the European Research Area and highly specialized labor markets. Learning how to provide value to specialists was the goal of my internship, besides getting international work experience and learning about the country and the region. What new did you learn about EURAXESS during your internship? I learned that Euraxess is a huge network, that is far greater than just the EU member countries, so even countries like Israel or Ukraine can be part of the network or contributing. So my first impression was that Euraxess is a good networking platform, to bring different institutions in Europe closer together through events, workshops and projects. As a leading part of European research initiatives Euraxess can be a marketplace, where employer, employee and institutions can meet, either in terms of hiring or changing jobs or in terms of common projects. So Euraxess is a very big institution, that is growing in terms of membership, institutions and individual researchers and highly qualified specialists registering on the job platform. You visited our local contact points and our EURAXESS colleagues in Greece at CERTH. What are your impressions? My impressions at the local contact points at South West University in Blagoevgrad and University of Plovdiv "Paisii Hilendarski" in Plovdiv as well as the meeting with the Euraxess colleagues in Greece at CERTH were really good. All of the colleagues were really supportive and nice in every aspect and in explaining about Euraxess and local conditions. There are local differences in terms of public relations and in the services offered, but overall Euraxess is working to improve both locally and internationally in terms of collaboration, networking and sharing best practices. The close collaboration with neighboring Euraxess networks was a great discovery during my visit of CERTH in Greece, who contributed a lot to the Euraxess network, in terms of project leadership and collaboration, which is long established with the Euraxess network in Bulgaria. Visiting the South West University gave me the impression of a modernized university, with an international perspective and scientific excellence. As I learned about their projects in the field of labour markets, I was surprised that my university HdBA – University of Applied Labour Markets in Germany was not involved in their international comparative labor market analysis, with a lot of different institutions collaborating in this project. In Plovidv I was impressed by the historic and cultural importance of the City, where many layers of history and new developments merge in many ways. Learning about molecular biology and the importance for farming as well as learning about the intercultural projects in the field of religion were very interesting and inspiring. So I am looking forward to discover more and deepen my understanding in many aspects. 5. What do like most about Bulgaria? Bulgaria is very green, has the best Yogurt in the world and wonderfully nice people. I am impressed. I think most surprisingly were the many trees and nearly forests inside the city. Where other countries try to promote projects like “Greening the University” or “Urban Gardening”, it is a very natural thing for Bulgaria to have a green and blooming neighborhood. Another surprise were the partly dual or multiple careers of researchers and scientists, who often seem to work in science, projects and in private businesses at the same time, with a good work life balance. So a lot of the people are having gardens and farms and keep working on the fields, even if they have a job in the university or in another institution. Also people tend to be familiar with each other and name each other with first names or nicknames in the work context, which gives a relaxed and nicely collaborative atmosphere. In terms of networking and individual support for visitors like me, the support is immense and extraordinary. To sum up I think it is a very natural and healthy lifestyle in found in Bulgaria in connecting the city and the village and nature and society in the best way possible. Generally, it is a good and quite affordable place to stay and to life, if you are coming from abroad for a shorter visit. If you are starting to live and work here, you have the opportunity to learn a lot about Bulgaria and the Balkan peninsula, with good comparative advantages, if you can secure external funding additional to your salary.